TOO MUCH TAXES: Rep. Cynthia Browning, D-Arlington, tells the GOP caucus why it would be better to allow a paid leave program if participants could opt out. 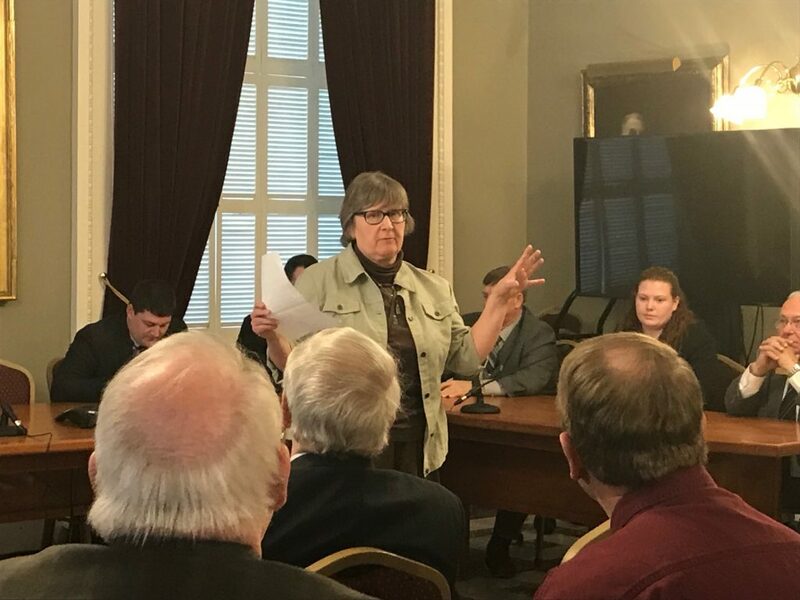 MONTPELIER — House lawmakers last week passed the universal paid family leave bill by a 92-52 vote, shunning amendments that would have eased the impact on taxpayers and allowed Vermonters who can’t afford the program to opt out. But not everyone was impressed. Rep. Cynthia Browning, D-Arlington, told True North that many who pay into the program will never see a benefit. Browning’s amendment to H.107 would have cut the paid leave period to four weeks, from the current 8-to-12 weeks, and would have allowed individuals to opt out. It was defeated on the House floor Thursday. She told her caucus before the vote that teenagers and elderly working 10 or 15 hours per week are an example of a group that will pay into this without ever seeing any benefit. She also said that she questions the cost estimate for the bill, which is $88 million. Her version would have cost $45 million, about half of the program that passed the House. The House Committee on General, Housing, and Military Affairs gave it’s prior approval of the bill, voting in favor by a 9-1 vote. Stevens argued that the program is a benefit for young families in Vermont. “This program will help attract more professionals to the state and encourage young people with families to stay in Vermont and level the playing field for small businesses,” he said. According to Stevens, more than 144,000 Vermont income tax filers made less than a “livable wage” for a two-person household without children. He calculated that as $13.34 per hour and 40 hours per week. Rep. Zachariah Ralph, P/D-Hartland, offered an amendment which would have let businesses pick up half the cost for the program, instead of being a payroll tax placed 100 percent on employees. “It’s a recognition of where the money comes from,” he said to the GOP caucus. The House voted down his amendment as well. Representative Scott Beck, R-St. Johnsbury, said he simply could not support the bill. “I just can’t support raising taxes on Vermonters by $88 million and spending it on this,” he said. Not to fear. Those who cannot afford the legislated grandiose ideal life, will opt out. They have no option. Of course that will mean either closing their business or moving their business out of Vermont. This is a very poorly thought out bill. Of the 345,000 +/- employees being taxed, a substantial number of these may already have paid family leave or will never need to apply for benefits. The estimated cost of $88 million is viewed by others as low- what happens and who gets taxed when the actual cost ends up 20% higher? What is the cost of a new IT system to run this program (remember VT Healthcare) when we could join with NH and spend 1/2 the set-up cost. It is unbelievable how these liberal legislators can continue to spend other peoples money with no end in sight. Doesn’t sound like you have a choice does it. I’m really starting to feel sorry for you folks left in VT. I’m trying desperately to get my inlaws out before it’t too late. Fingers crossed ! If the workers can’t afford the leave insurance just increase their pay.I see the business owners with their King Rancher $80k pick-up trucks.How dare they cry poor mouth.Without workers you have no business. Just another tax grab on the backs of small business…………as a small business owner this does nothing for me wanting to hire or retain employees…………small business is at the breaking point with the payroll tax etc etc and now this. The folks in our legislature do not understand nor care about business in this state. Business drives employment and thus vitality. And somehow they have not realized that our state population is getting smaller due to their tax and spend at all costs attitude. Pure insanity for a population of about 500,000. If paying payroll tax or family leave tax is too much perhaps you already don’t have a viable business.A big problem is that business owners want to take too much income for themselves.A worker should make enough to rent an apartment,pay utilities,food,transportation(including car insurance),and co-pays for healthcare visits. If the job doesn’t pay enough to cover all of these items,it’s just not a job worth having.Worker pay has stagnated for 30 years,while productivity and profit have grown immensely.Workers are wising up and walking away from greedy employers.A company is only as good as it’s people.You get what you pay for.This applies to purchases or the quality and effort that the worker brings to the company.Low pay= low effort and an employee that will walk in short order. Here we go again, cost? who cares? The Dem,Lib, Progs certainly ddon’t. Mind Trust in Montpelier have an agenda and they don’t care. never ran any type of business. Family crisis and health issues happen to each and every one of us.This doesn’t mean that the bills stop coming.People need this as a stop gap so the crisis doesn’t become terminal.I’m sure that you don’t stop taking a paycheck when crisis happens to you. Another cut in pay for hard working Vermonter’s brought to you by your friendly Dems/Prog. Get out and vote people. Are the Representatives in Montpelier going to get this tax taken out of their earnings? So people who can never make use of the program have to pay for it. These liberals are using this not to help people, but to get votes for themselves. — Its beginning to look like revolution is the solution. That’s just great, everything free in America, especially Vermont.